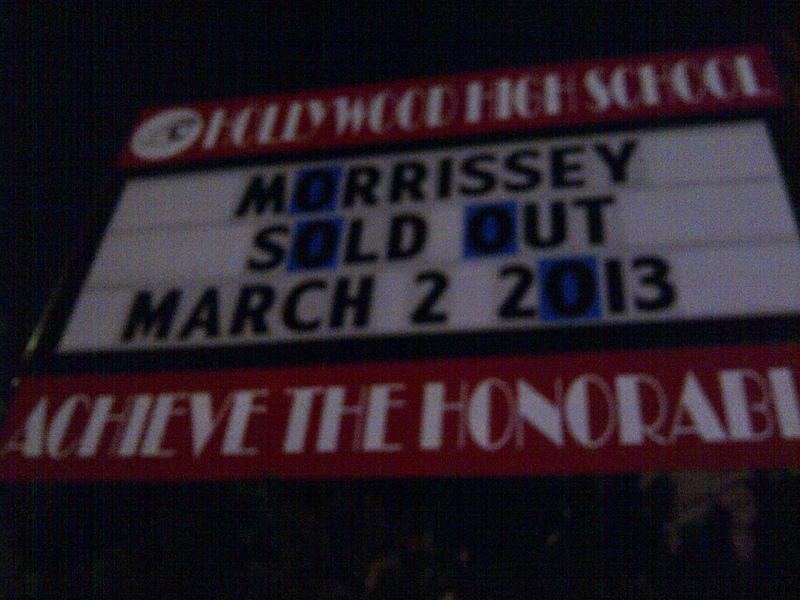 Last night I went to see Morrissey playing a tiny little show at Hollywood High, being a lapsed fan I thought how could I pass up a chance to see someone that once basically ruled my world at such a special place. I didn’t factor in that the auditorium built decades ago and has along with the rest of the school been designated a historical landmark would still have those tiny little seats! I’ve always been fortunate enough to be able to fit into seats even if it took a bit of maneuvering but no such luck on these ones. I could sit on the edge or go in kind of at an angle but I was definitely looking forward to when Moz took the stage and the whole crowd stood up. My feet were starting to fall asleep with the weird angles I had to tuck my legs underneath me while sitting on the edge of the seat during the opener. I was at least not alone in this, there seemed to be several of my fluffy counterparts around the auditorium with similar challenges! Other than the seating issues it was a good show! We had extra tickets and sold them to two very young fans that had never seen Morrissey live and even though it was general admission we still found ourselves sitting next to them. After spending a few hours with them in line waiting to go in it was like we had kind of adopted them and wanted to make sure they had a decent night. They looked a little bored during most of the show but every bit of Smiths that made it into the set list brought a wave of emotion from them. I’m sure if it was 20 years ago and Morrissey had broken out a Smiths song during one of his solo shows I would have had a similar reaction. But as a weary 38 year old that had seen so many shows in the past it just didn’t hit home like it did for these kids. Just jaded with age I suppose! I did hit the merch stand last night though and passed up on some of the more interesting offerings with Morrissey being set as a religious icon and settled for a lithograph print of some lyrics from Still Ill and a set of pins. Being the best ticket scalpers in the world I passed on a pin to the couple we sold the tickets to. All in all not a bad night out even with the stiff little wooden seats and the anti-meat propaganda break in the middle of the show.